Hi guys! I've got a bit of an extreme manicure to show you today. 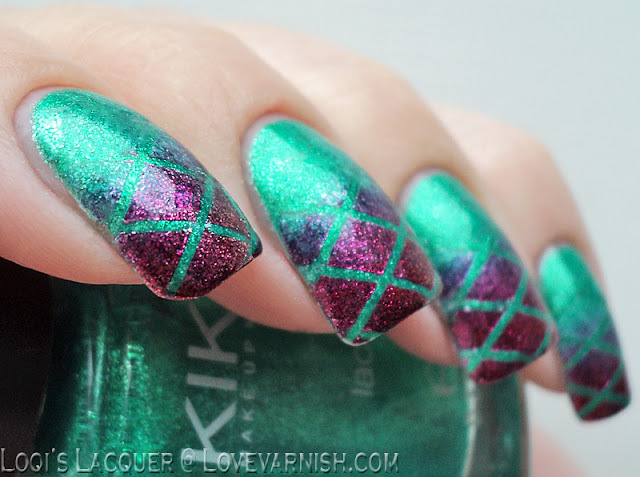 I wore one of my gorgeous new Kiko polishes a while ago and after a few days I had some tipwear but I wasn't ready to take it off just jet, because it's such a pretty color! 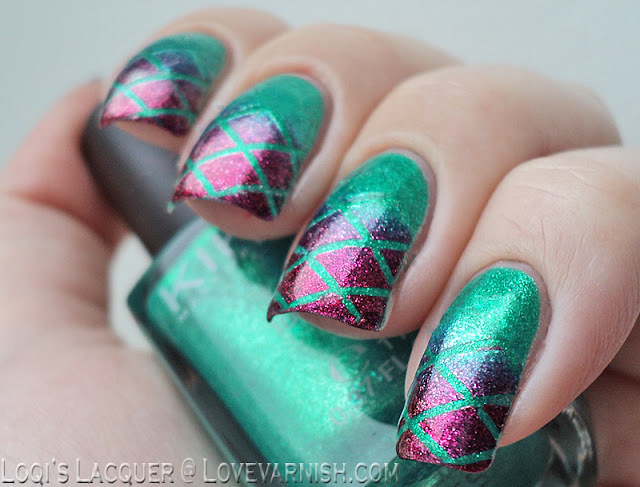 So I thought I would do a taped gradient over it! 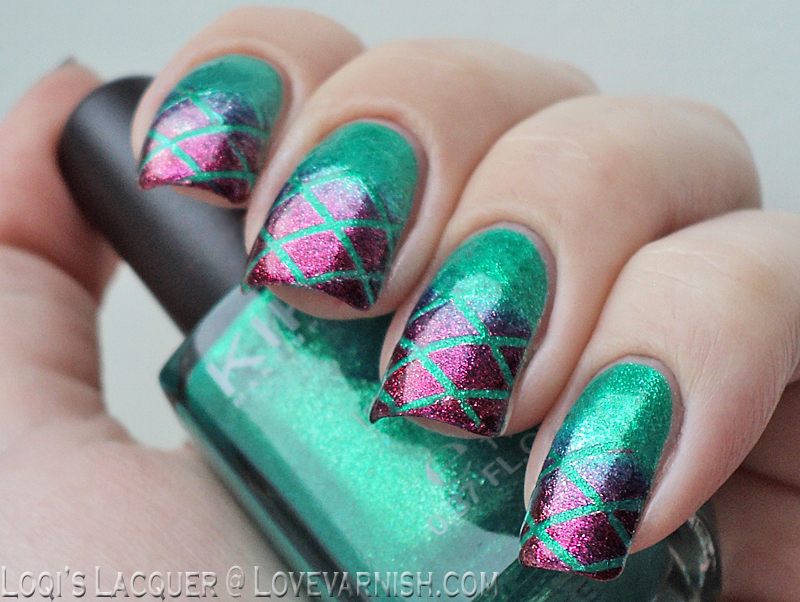 I chose a really contrasting color to do the gradient with though, so the result is a bit out there! 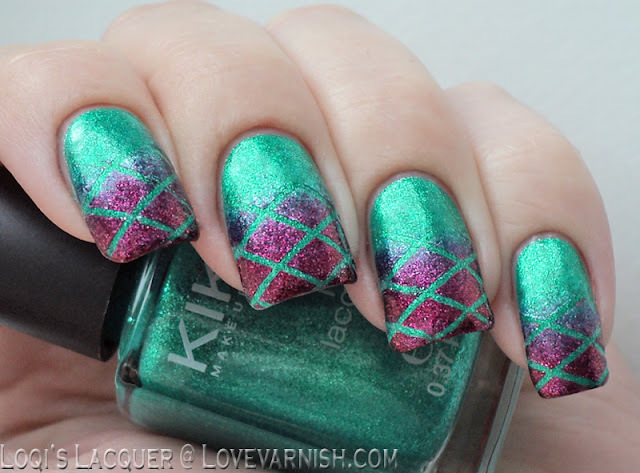 The basecolor I used for this manicure is the gorgeous Kiko 531 Pearly green butterfly, a fantastically bright mint green shimmer (almost foil). After I had worn that for a couple of days I used striping tape to create a criss-cross patten and then stamped over it with a sponge and Kiko 277 Blueberry glitter. The result is this bight and extreme snake like pattern. I've been debating whether or not to post this manicure for quite a while now (I did it a couple of weeks ago) because I'm still not sure weather or not I actually like it. It was quite a bit of work though, so I thought I would share it anyway! I hope you guys like it, if you do, please let me know in the comments and see you next week!